The wide, deep hulls of these large models are made for transporting large loads of fishermen and gear. 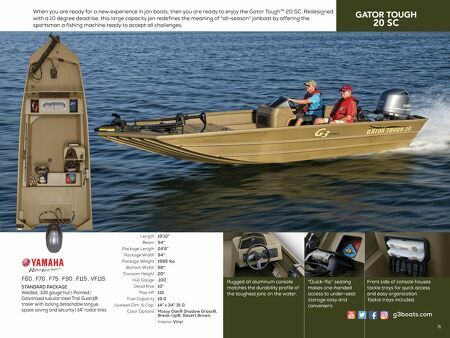 Performance is not lost with the extra capacity, as the 20 CC models have 10 degree deadrise hull design, for quick hole shot, a smooth flat ride, and maximum efficiency. More performance with less horsepower. The 20 CC models are the boats that guides and outfitters trust. For those professionals, "Gator Tough™" is not just a motto... it's a way of life. STANDARD PACKAGE Welded, .100 gauge hull | Painted | Galvanized tubular steel Trail Guard® trailer with locking detachable tongue, space saving and security | 14" radial tires Extra large 31 gallon divided livewell has 500 gallon per hour aerator pump. Insulated lid helps keep your catch fresh all day. F60 . F70 . F75 . F90 . F115 . VF115 19'10" 94" 24'6" 94" 2020 lbs 66" 20" .100 10° 115 19 G 11" x 21" 16 G + 14" x 34" 31 G Mossy Oak® Shadow Grass®, Break-Up®, Desert Brown Interior Vinyl Length Beam Package Length Package Width Package Weight Bottom Width Transom Height Hull Gauge Dead Rise Max HP Fuel Capacity Livewell Dim. & Cap. Color Options 74 Optional leaning post sports a camo pattern cushion for comfort while standing and driving. 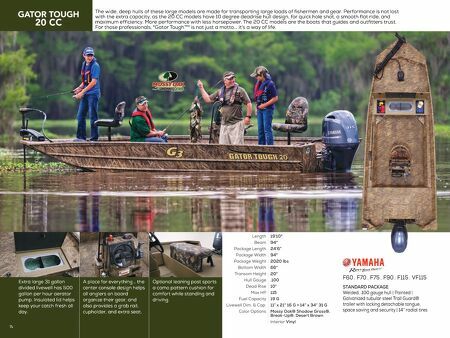 A place for everything... the center console design helps all anglers on board organize their gear, and also provides a grab rail, cupholder, and extra seat.